Boar bristle brushes may not seem like the most comforting or luxurious brushes on the market, but there’s a reason they’re still around and making their way into households around the world. While it’s upped its game in recent years, they’ve always been somewhat-popular due to how effective they are at distributing the oil in our hair, and taking it from our greasy scalps, to the dry ends of our hair, for a healthy, shiny, and fresher look. However, not all of them are of the same level of quality. Want the best boar bristle brush for yourself? Then keep reading, because we have them all right here! Now that you’ve had a chance to skim through each of the best boar bristle brushes, you probably want to know more about each one. Scroll down a bit further to read in-depth reviews about each of the products you have your eyes on! The Pure Boar Bristle Brush from Beauty by Earth is truly one of the best on the market today, and once you use it, you’ll see why. 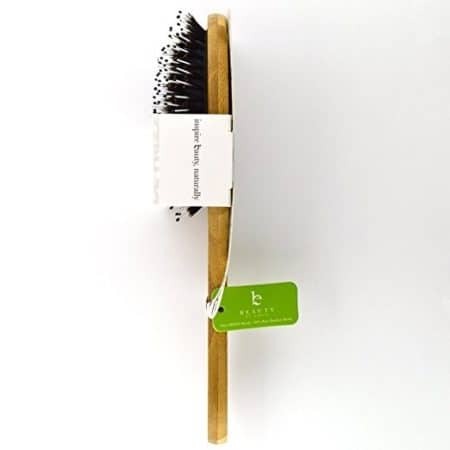 The brush combines 100% boar bristles, along with nylon pins to help detangle tough knots, as well as helps to distribute oils from the scalp, evenly. Each pin is placed in a certain spot in order to most effectively stimulate your scalp, and make sure you’re on your way to shiny and tamed hair from top to bottom. That it’s actually made from one of the most sustainable plants on our planet, which is bamboo. Not only is this eco-friendly, it’s also very durable, strong, and feels nice in the hands. If you’re looking for a great brush for not just you, but the entire family, then you’ll love this one, too. However, if you are just hunting for one of the best boar bristle brushes currently on the market today, just for your own follicle needs, then don’t skip over this one. It works for normal-to-thick hair types, so if you have thin hair, you may want to select a better-suited product from our list! This is definitely one of our favorite boar bristle round brushes, for many reasons. If you or someone else in your family is suffering from stubborn tangles and hang-ups, then this will definitely help you find some relief. However, it’s kind of complicated, as you do need to detangle with another brush or your fingers, beforehand. A boar bristle brush in itself is actually going to cause you more tangles and knots. However, afterwards, by brushing with your new boar bristle brush, you’ll find that you have less recurring tangles, and will experience more manageable, soft locks. We also loved how this brush distributed the oil around. Rather than keeping it all towards the roots, it worked to evenly distribute it around the length of our hair, creating a healthier look and feel. We found the best way to do this, was to bend over, allowing your hair to fall over towards the ground. By beginning at the roots, you’ll want to move the brush towards the tips of the hair, and do this repetitively for a few minutes. The brush requires a lot of maintenance. You’ll need to remove any collected hair with a wide-tooth comb so you don’t accidentally take out any bristles. In addition, they’ll need to be washed in shampoo and wiped gently with a cloth, afterward. 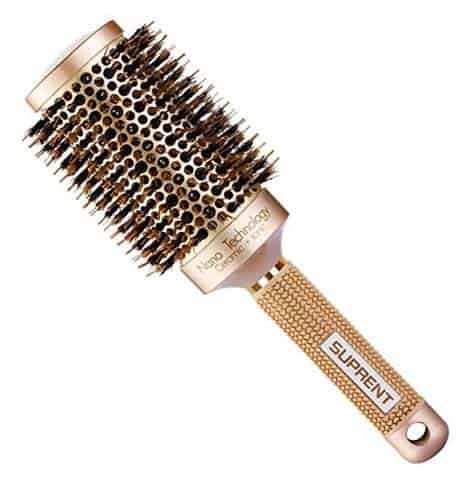 We absolutely loved this soft bristle brush for cleaning hair. Anyone who loves a good scalp massage is going to want to pick up the Spornette DeVille Cushion Oval Boar Bristle Brush, immediately! The brand has been around for over three generations, and is one of the leading companies in creating high-quality hair brushes for various hair types. This soft boar bristle brush is 100% natural, and works to keep hair looking and feeling clean, while getting rid of some of the oil around your roots and hair cuticles. Not only does it work to distribute oil evenly, it also helps prevent oil from building up on the scalp. It features a smooth, lux wooden handle, which is not only durable and strong enough for thick hair, but is also very comfortable in the palm of the hand, due to a convenient curved handle design. The bristles are all placed very close together in the pin cushion and are very sturdy, so you don’t have to worry about them easily coming out or breaking. This makes it great for getting out tangles and taming frizzy locks. If you have curly hair, you’ll love how well this one navigates and gets rid of any knots with ease. 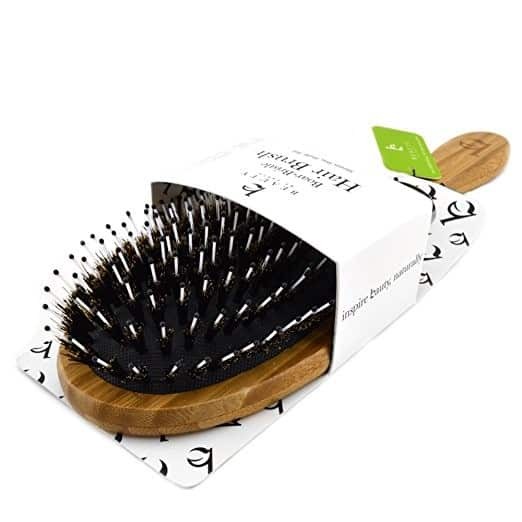 If you are trying to grow out your hair, using this brush will work to promote hair growth through increasing blood flow and unclogging hair follicles, allowing for improved circulation! We loved this brush, and found that it overall really increased the health of our hair, and even a bit of growth! Before the use of flat irons and curling irons, boar bristle brushes were widely used by women to smooth and set hair. There’s a reason why these brushes have been around for so long, and the Spornette DeVille is a great testament to that. With that being said, there are some that are a bit painful to use. Which is why we loved using this one; it is gentle and feels like a scalp massage. With regular use (which is definitely easy to fulfill), you’ll notice your hair becoming cleaner and cleaner with each use. Actually, the first time using it, you can see a difference in how your hair looks! While it wasn’t the most comfortable in the world, it was relatively comfortable to use, with the curved, ergonomically-designed wooden handle. The luxurious feel of the bristles are really the shining star here, and even if you have thick hair, you’ll see impressive results. Is your family comprised of more than just you? Then you’ll find this brush makes the rounds in your household. It’s perfect for women, men, and children, and works with all hair types: natural, treated, ethnic, coarse, wavy, or thin hair all works! The only thing to remember, is that if you do have thin hair, using this brush may cause some fly-aways. However, it will still improve the shine and silkiness of your hair, even if it is thin. The oval/paddle shape is perfect for styling and blowouts, or even for smoothing and setting hair. You’ll also love the protective rubber cushion, which prevents breakage and helps to detangle hair by absorbing the “shock” or brushing it. 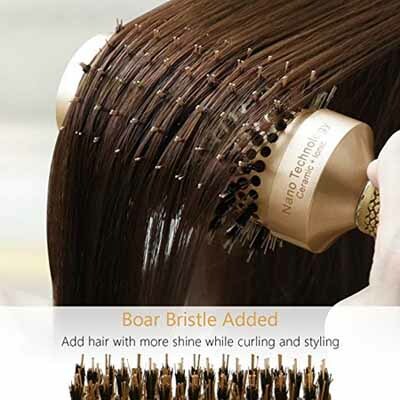 Now, you may have noticed that many boar bristle brushes aren’t ideal for thinner hair. 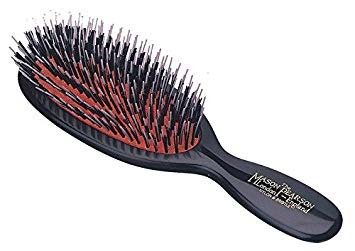 If you do have thinner locks, or really any hair type, you’re going to fall in love with the Mason Pearson Junior Brush. When speaking about brushes, Mason Pearson is one that will inevitably come up. The company is out of London, England, and has been producing some of the highest-quality hair products since 1885. Once you receive yours, you’ll easily be able to tell why they’ve been successful for well over a century, now! But what’s so amazing about it? 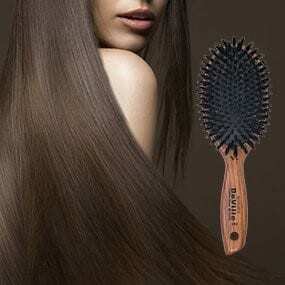 The brush is very gentle; probably the most delicate on the hair and scalp that we’d used. Many times, people become used to their hair being tugged and snagged while brushing. Your hair-grooming experience shouldn’t be painful! Mason Pearson has made it downright relaxing. The handmade brushes utilize many of the original, patented techniques by Mason Pearson, himself. The Junior Mixture model, which was our favorite, features a combination of both nylon and natural boar bristles. The duo work together to glide through hair with ease. 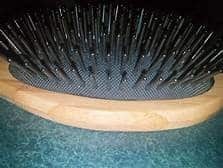 Plastic bristles are featured in many of the brushes on the market today, and can damage the hair and hurt by pulling. The bristles sit in a rubber cushion which is unlike any other you’ll see on the market. It works to help reduce the blow of brushing to delicate hair, and flexes, rather than scratches and irritates. This pure boar bristle brush is super effective at taking oily build-up from the scalp and moving it towards the dry ends of the hair. This in turn, gives a more healthy look and feel, and will leave your hair feeling shiny and more manageable, without the excess grease. We had a wonderful experience with the Mason Pearson, from the moment we received it, until after we were done grooming with it. It comes in a gorgeous package, and you can tell before even opening it, that it’s made with high-quality design in mind. A good quality hair brush is essential to beautiful, healthy hair, and while many will consider this brush a splurge, it’s absolutely worth it. The price is definitely higher than any of the others on our list, however, this brush is made to last for decades. Some users have even reported having their brushes from the 60s and 70s! If you consider the cost per use, we can practically guarantee that this will actually end up being the most affordable product out there! The build is extremely sturdy and durable, and is great for literally all hair types, from very thick and dense hair, to light and thin. We really enjoyed the little details, like the hand-carved logo in the handle. While it may seem like something insignificant, it’s a further indication of the level of quality you’re receiving. The brush is very easy to use, and detangles so easily, you’ll forget how you ever used another brush on your hair for so long. Instead of getting hung up and pulling hair, it easily works through it. It also just feels more gentle. While it’s recommended you only use it on dry hair, we used it on both wet and dry hair and it gave wonderful results both times. It is actually pleasant to use! Instead of scraping against the scalp, its rubber cushion pad flexes with the shape of your head, so you won’t be experiencing anything but a wonderful massaging experience. Not only does it feel good, but it works to boost blood flow, stimulating hair growth by bringing nutrients to the scalp. Many boar bristle brushes can redistribute oil, but not many can really have a cleaning effect like the Mason Pearson. It works to clean up the roots, by loosening any dead skin/other impurities, while absorbing and distributing oil evenly throughout the length of the hair. Finally, it’s perfectly portable, being lightweight and relatively well-sized, you can easily slip it into your purse or carry-on without a hitch! Looking for a boar bristle brush the whole family can use? Look no further than the Bestool Brush. This durable, well-designed brush is one of the gentler ones, and can even be used on children, with ease. If you need extra help styling or taming frizz, then this is definitely one that fits the ticket. It features a mix of boar bristles and nylon pins. This works to help detangle thick hair or even hair extensions, all while adding shine, and improving the softness and health of your hair. 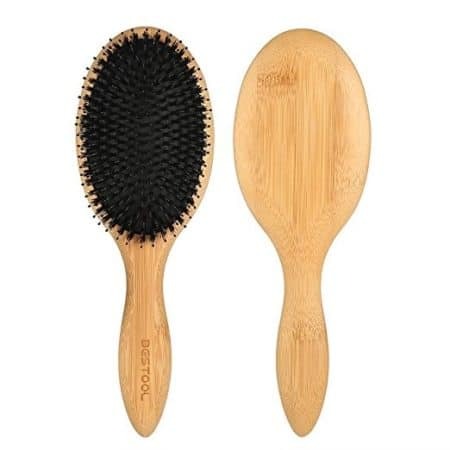 Frizz and knots will easily disappear with the addition of this boar bristle round brush. The smoothness and lightweight feel can be attributed to the fact that it’s made out of bamboo, which is not only great for the environment, but is also very durable and sturdy. The rubber cushion helps to make the experience gentle on your hair, while still remaining an effect grooming product. All materials are moisture-proof and insect-proof, so you don’t have to worry too much about it getting easily damaged. Then we highly recommend going with this one. It’s probably the least expensive product out there, at the high level of quality it sits at. If that weren’t enough, it also conveniently comes with a cleaning tool and a drawstring bag which makes it easy to travel with. The cleaning tool takes out hair and other debris with ease, and without damaging any part of the brush. Truth be told, we were pretty surprised at how much we loved the Bestool, considering how inexpensive it was. We’re not sure how they do it, but it’s one of the sturdiest and most eco-friendly we’d found, all while doing the job well. The nylon pins are stiff, but not so hard that they hurt; just enough to give a nice massage and stimulate that blood flow to the roots of the hair. 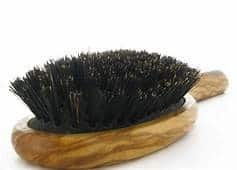 The boar bristles help to distribute the oil along the hair shaft, and also helps to reduce any itchiness and/or dandruff you may have going on. One of the things that we loved about the nylon/boar bristle combo, was that it worked better on curly and thick hair that can sometimes be hard to thoroughly clean the scalp. These ones helped reach the roots better, and thus, cleaned up nicer. 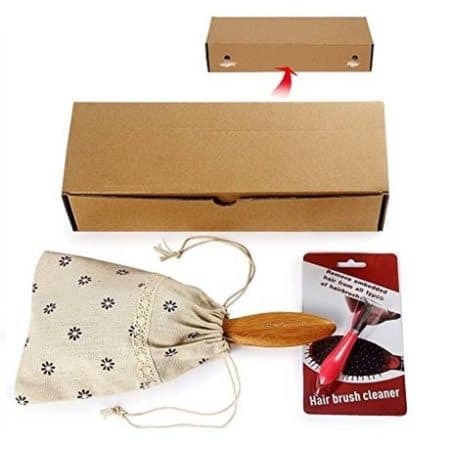 The little cleaning tool and drawstring bag may be small additions, but they were very thoughtful and helpful in the maintenance of this product. The number one issue we had, was the rubber smell upon receipt of the brush. While it did go away after a couple weeks, it was a bit irritating for the first few uses. The second issue, is that it cannot be used with wet hair. This may not be an issue for some, but it’s worth noting. Many of us have thin or very “light” hair that just doesn’t seem to want to do anything. You try to curl it, and it comes out. You try to create volume, and it doesn’t last. What can you do? We have a pretty good solution for you, and it may be something you’ve never considered. The Suprent Thermal Ceramic Round Boar Bristle Brush may look a bit odd, but we can assure you, it’s going to give you that coveted volume and smoothness you’ve been looking for. This round barrel hair brush is unique in its shape, but also due to the fact that it’s made with ceramic. We all know that our scalp naturally produces sebum, which works to protect our skin and hair. The boar bristles featured here work to disperse the sebum evenly, and lubricate it from top to bottom, creating healthier, shinier tresses. What does the barrel shape do? It works to create volume by lifting up at the roots, along with increasing the shine of your hair. It’s also anti-static and anti-bacterial, so you don’t have to worry about anything growing in your brush, even if you get it wet! With their nano ionic technology, it further helps to reduce frizz and add shine, increasing the overall look and health of your hair. The cuticles become sealed, to create a smooth, silky-soft texture from top to bottom. The barrel heats up while drying, to help create loose curls and waves, as well as decreasing dry time to help you save time getting ready in the morning! This brush isn’t for everyone, but it is a wonderful choice if you’re looking to seriously increase the volume in your tresses, or just overall add a lot of shine and silkiness. The round barrel is a bit more difficult to use than your traditional paddle brush, just because you have to get used to the design and avoid it catching any hair and creating knots. Once you get used to it, you’ll be just fine. The ergonomically-designed handle is actually quite comfortable, and is a textured, single piece, so you can use it without getting hand cramps or pain. With negative ions, it helps in curling and styling hair, all while reducing any frizziness and adding shine. As cuticles are sealed, you’ll see a huge difference in texture, and will end up with silky-soft locks that you may have never known you could achieve before! With shorter hair styles, it easily straightens, and with longer hairstyles, it gives you coveted, perfect waves with ease. That it’s not 100% boar bristles. Instead, it has a nylon yarn/boar bristle mix, which is similar in many ways, but still different in terms of durability and quality. 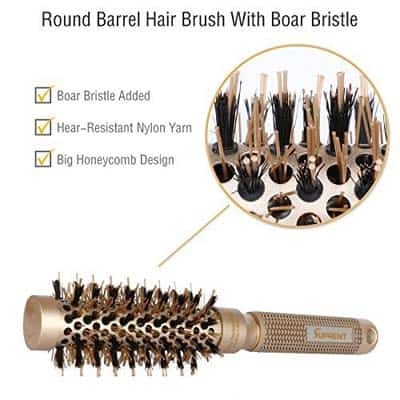 Now that you’ve taken a thorough look through each of the best boar bristle brushes currently on the market, today, you may have already decided which one is the one for you. However, there’s also the chance that you haven’t. If you haven’t, perhaps you just don’t know which one will suit your needs, or what exactly you should be looking for. That’s why we’ve taken it upon ourselves to write this buying guide. It will take you, step-by-step, through each consideration so that by the end, there’s no doubt about which one will be going in your shopping cart! First of all, you’ll probably want to establish how much you’re willing to spend on your new brush. That way you can easily begin to narrow your viable options down. No one wants to purchase a product, only to feel that they’ve spent too much on it. By making a budget for yourself, you won’t have to worry about that from happening. Don’t only consider the price tag, however. Also take into consideration how durable the product is, and how long it’s going to last you. For example, a bamboo brush may cost you more than the plastic one, but it’s going to last you many times more, thus saving you money. Also keep in mind that at a certain price point, may brushes go up in quality, immensely. For example, there are definitely a huge variety of inexpensive boar bristle brushes. These may not have some important features that the more expensive options have, such as a cushion, which helps to let air through, prevent molding, and is generally easier on the hair. What are you going for, exactly? Are you simply looking for something to help prevent tangles or make your hair softer and more manageable? If that’s the case, the traditional paddle brush is often the way to go. Perhaps you’re looking for more volume or that “thicker” feeling to your hair. With those needs, we recommend going for one of the ceramic barrel brushes. These are going to lift your hair at the roots, easily distribute oils evenly, and just generally make it look healthier. It’s also important to take into consideration the type of hair do you have. Do you have thick, naturally-curly hair? Perhaps you have very thin, flat hair. You’re going to want to probably choose a different product depending on the type. While there are a few options that work well for just about any hair type, this is more the exception than the rule, so pay attention to the hair types your new brush work with. Have you selected the best boar bristle brush for you? 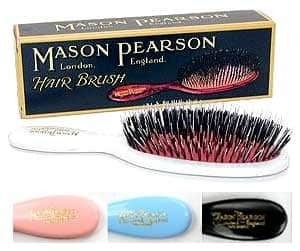 If not, then allow us to reiterate how much we loved the Mason Pearson brush. There are various reasons why, but to be honest, we just could not find another product on the market that even came close in terms of quality and results. The hand-crafted products are made to last for literally decades, and are incredibly sturdy and durable. They work to distribute oil and clean around the scalp while boosting hair growth. It’s also very gentle on the hair and scalp, and rather than tugging or scratching, works just like a scalp massage! It may be more expensive, but it’s absolutely worth it. So, which one of these best boar bristle brushes will be making its way into your home?